The depths of forest lakes and rivers host abundant fish habitat. Lowland meadows teem with birds and wildlife. Even from miles away, the peak of Mt. Shasta soars to an elevation of 14,162 feet and serves as a visual centerpiece to the beautiful landscape of the Shasta-Trinity. Within its boundaries are portions of five different federally designated Wilderness Areas, a designated National Wild and Scenic River, and towering stands of trees that work in harmony to create a home for more than 400 species of mammals, birds, and fish. Water is a key feature on the forest. The fresh water within hundreds of mountain lakes, more than 6,000 miles of streams and rivers, and Shasta Lake, California’s largest man-made lake, are protected by the forest’s trees. The summer of 2008 was the worst and most extensive fire season in the history of the Shasta-Trinity National Forest. Hundreds of fires, including the Lime Complex Fire, Iron Complex Fire, and Lightning Complex Fire of 2008, burned thousands of acres of forestland, scorching trees and seeds to the point where natural regeneration will not take place. To bring life back and to ensure that the Shasta-Trinity continues to thrive and benefit the environment for generations to come-replanting is desperately needed. 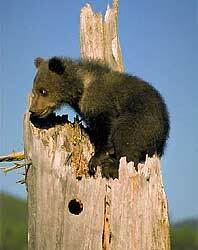 With your help we want to support the Arbor Day Foundation in Shasta-Trinity National Forest. The ADF and the National Forest Service want to plant 640,000 new ponderosa pine, Jeffrey pine, incense cedar, and Douglasfir trees as part of the restoration of this beautiful and scenic forest. 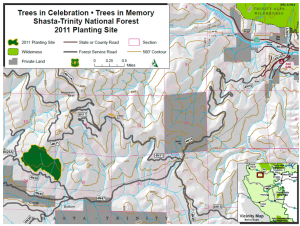 So every tree counts, every blog post is one litte step to reforest the Shasta Trinity National Forest. Make your blog carbon neutral – now!